Maina Chawla Singh’s doctoral research focused on gender and colonialism, especially the work of missionary women in colonial India. 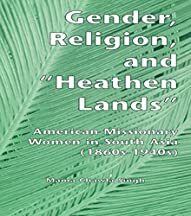 This was published as Gender, Religion, and ‘Heathen Lands’: American Missionary Women in South Asia (1860s – 1940s), (New York: 2000). This was followed by the publication of several essays on the history of colonial medicine and women in colonial India. Maina Chawla Singh’s recent book focuses on the Indian Jewish community in Israel. From 2005-2008, Singh researched and lectured in Israel at Bar-Ilan, Haifa and Tel Aviv universities. Based on ethnographic fieldwork done in Israel, ‘Being Indian, Being Israeli’ (2009;2010) is the first comprehensive study analyzing the migration experiences of the three Indian Jewish communities now living in Israel. Following this, Singh has been engaged in the study of contemporary Israeli society, especially exploring issues of ethnicity, migration and ‘Jewish-ness’. An on-going project focuses on the migration narratives of first-generation Indian-Jewish women who came from Bombay, Calcutta and Cochin in the 1950s, ’60s , and ’70s and were settled in moshavs, ‘development towns’ and elsewhere in Israel…. Singh has lectured widely at international institutions including at Oxford, Cambridge, Yale, Cornell, Michigan, Indiana, Brandeis, and at the Library of Congress. In 2008, Singh was Scholar, Haddasah-Brandeis Institute. In 2009, she was a Fellow at Schusterman Center for Israel Studies, Brandeis University. Since 2009 Singh has been Scholar-in-Residence at American University, Washington DC, lecturing on ‘Contemporary India’ and on ‘Indian Diaspora Communities’. In 2010-2011, Dr Singh offered several lectures on ‘Migration, Ethnicity and Identity in Israeli Society’ and ‘Contemporary Israeli Society’ at Georgetown University. Wide-ranging international and cross-cultural experiences have inspired Maina Singh to be keenly interested in diaspora, identity and cross-cultural communication. Her current project explores the engagement of Indian Americans in US policy and politics. Dr. Singh has lived in Russia, Ethiopia, Japan and Israel. She speaks several languages including Urdu, Punjabi and Russian.